How to incorporate Design Thinking into the Training design? Thanks to a well-designed learning journey the participants of intercultural and storytelling programs are empowered to try out new perspectives, be creative and gain many new insights. Very often they are encouraged to practice out of box thinking and therefore see their challenges in a new light and in best-case scenario consider them opportunities to grow and start to develop new skills to deal with rapid changes. 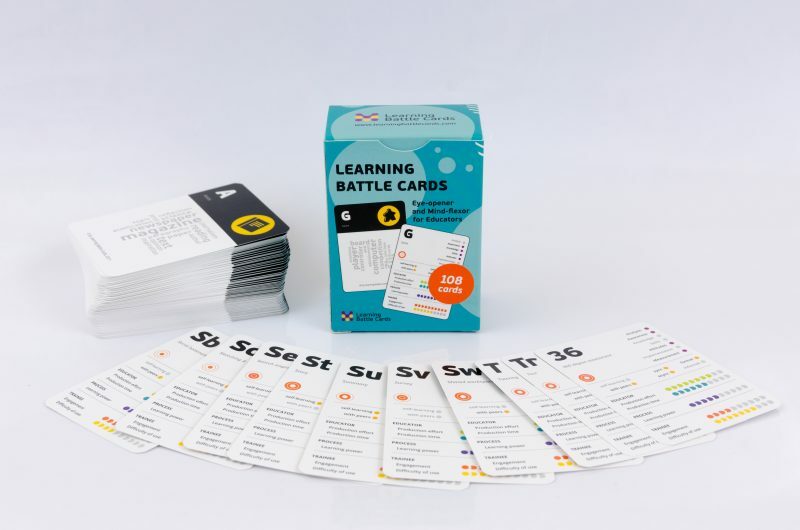 Similar dynamics happen when professionals (trainers, workshop and curriculum designers) decide to use the Learning Battle Cards for the learning journey design. The cards give them the fan of choices for the well-designed process, whereas the canvas offers them a solid framework to provide arguments not only what elements of the learning journey are necessary but also why they add value to the entire learning process. prepare a simple visual representation of this learning journey, which could be easily discussed with stakeholders. Apart from the above – it lets you design the entire learning process in the human-centered, collaborative, iterative, prototype-driven and playful way. Additionally (and this is the best part) it lets you co-create the whole or part of the training program with your customer.